Biochim Biophys Acta. 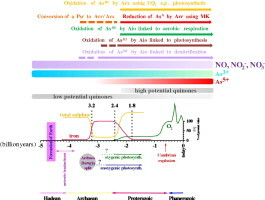 2013 Feb;1827(2):176-88. doi: 10.1016/j.bbabio.2012.08.007. Epub 2012 Sep 7. Review. Although at low concentrations, arsenic commonly occurs naturally as a local geological constituent. Whereas both arsenate and arsenite are strongly toxic to life, a number of prokaryotes use these compounds as electron acceptors or donors, respectively, for bioenergetic purposes via respiratory arsenate reductase, arsenite oxidase and alternative arsenite oxidase. The recent burst in discovered arsenite oxidizing and arsenate respiring microbes suggests the arsenic bioenergetic metabolisms to be anything but exotic. The first goal of the present review is to bring to light the widespread distribution and diversity of these metabolizing pathways. The second goal is to present an evolutionary analysis of these diverse energetic pathways. Taking into account not only the available data on the arsenic metabolizing enzymes and their phylogenetical relatives but also the palaeogeochemical records, we propose a crucial role of arsenite oxidation via arsenite oxidase in primordial life. This article is part of a Special Issue entitled: The evolutionary aspects of bioenergetic systems. Heterologously expressed arsenite oxidase: A system to study biogenesis and structure/function relationships of the enzyme family. van Lis R, Nitschke W, Warelow TP, Capowiez L, Santini JM, Schoepp-Cothenet B.
Biochim Biophys Acta. 2012 Sep;1817(9):1701-8. doi: 10.1016/j.bbabio.2012.06.001. Epub 2012 Jun 12. Studies of native arsenite oxidases from Ralstonia sp. S22 and Rhizobium sp. NT-26 raised two major questions. The first one concerns the mode of the enzyme’s membrane-association. It has been suggested that a hypothetical not conserved protein could account for this variable association. Expression of the wild type arsenite oxidase in Escherichia coli allowed us to study the cellular localization of this enzyme in the absence of such a hypothetical partner. The results with the Ralstonia sp. S22 enzyme suggest that no additional protein is required for membrane association. The second question addresses the influence of the disulfide bridge in the small Rieske subunit, conspicuously absent in the Rhizobium sp. NT-26 enzyme, on the properties of the [2Fe–2S] center. The disulfide bridge is considered to be formed only after translocation of the enzyme to the periplasm. To address this question we thus first expressed the enzyme in the absence of its Twin-arginine translocation signal sequence. The spectral and redox properties of the cytoplasmic enzyme are unchanged compared to the periplasmic one. We finally studied a disulfide bridge mutant, Cys106Ala, devoid of the first Cys involved in the disulfide bridge formation. This mutation, proposed to have a strong effect on redox and catalytic properties of the Rieske protein in Rieske/cytb complexes, had no significant effect on properties of the Rieske protein from arsenite oxidase. Our present results demonstrate that the effects attributed to the disulfide bridge in the Rieske/cytb complexes are likely to be secondary effects due to conformational changes. The ineluctable requirement for the trans-iron elements molybdenum and/or tungsten in the origin of life. Schoepp-Cothenet B, van Lis R, Philippot P, Magalon A, Russell MJ, Nitschke W.
Sci Rep. 2012;2:263. doi: 10.1038/srep00263. Epub 2012 Feb 13. An evolutionary tree of key enzymes from the Complex-Iron-Sulfur-Molybdoenzyme (CISM) superfamily distinguishes “ancient” members, i.e. enzymes present already in the last universal common ancestor (LUCA) of prokaryotes, from more recently evolved subfamilies. The majority of the presented subfamilies and, as a consequence, the Molybdo-enzyme superfamily as a whole, appear to have existed in LUCA. The results are discussed with respect to the nature of bioenergetic substrates available to early life and to problems arising from the low solubility of molybdenum under conditions of the primordial Earth. Lieutaud A, van Lis R, Duval S, Capowiez L, Muller D, Lebrun R, Lignon S , Fardeau M-L, Lett M-C, Nitschke W, and Schoepp-Cothenet B.
J Biol Chem. 2010 Jul 2;285(27):20433-41. doi: 10.1074/jbc.M110.113761. Epub 2010 Apr 26. We characterized the aro arsenite oxidation system in the novel strain Ralstonia sp. 22, a β-proteobacterium isolated from soil samples of the Salsigne mine in southern France. The inducible aro system consists of a heterodimeric membrane-associated enzyme reacting with a dedicated soluble cytochrome c554. Our biochemical results suggest that the weak association of the enzyme to the membrane probably arises from a still unknown interaction partner. Analysis of the phylogeny of the aro gene cluster revealed that it results from a lateral gene transfer from a species closely related to Achromobacter sp. SY8. This constitutes the first clear cut case of such a transfer in the Aro phylogeny. The biochemical study of the enzyme demonstrates that it can accommodate in vitro various cytochromes, two of which, c552 and c554, are from the parent species. Cytochrome c552 belongs to the sox and not the aro system. Kinetic studies furthermore established that sulfite and sulfide, substrates of the sox system, are both inhibitors of Aro activity. These results reinforce the idea that sulfur and arsenic metabolism are linked. J Biol Chem. 2010 Jul 2;285(27):20442-51. doi: 10.1074/jbc.M110.113811. Epub 2010 Apr 26. Here, we describe the characterization of the [2Fe-2S] clusters of arsenite oxidases from Rhizobium sp. NT-26 and Ralstonia sp. 22. Both reduced Rieske proteins feature EPR signals similar to their homologs from Rieske-cyt b complexes, with g values at 2.027, 1.88, and 1.77. Redox titrations in a range of pH values showed that both [2Fe-2S] centers have constant Em values up to pH 8 at ∼+210 mV. Above this pH value, the Em values of both centers are pH-dependent, similar to what is observed for the Rieske-cyt b complexes. The redox properties of these two proteins, together with the low Em value (+160 mV) of the Alcaligenes faecalis arsenite oxidase Rieske (confirmed herein), are in line with the structural determinants observed in the primary sequences, which have previously been deduced from the study of Rieske-cyt b complexes. Since the published Em value of the Chloroflexus aurantiacus Rieske (+100 mV) is in conflict with this sequence analysis, we re-analyzed membrane samples of this organism and obtain a new value (+200 mV). Arsenite oxidase activity was affected by quinols and quinol analogs, which is similar to what is found with the Rieske-cyt b complexes. Together, these results show that the Rieske protein of arsenite oxidase shares numerous properties with its counterpart in the Rieske-cyt b complex. However, two cysteine residues, strictly conserved in the Rieske-cyt b-Rieske and considered to be crucial for its function, are not conserved in the arsenite oxidase counterpart. We discuss the role of these residues.